The Board of Trustees is in the very beginning stages of developing a new strategic plan for the Library’s future. The Strategic Plan FY2016 and beyond is the most recent plan; however the Board is considering new ideas and options. A new Building Assessment 2017 was completed in April 2017. The Board of Trustees is concentrating on the Fiscal Year 2018 budget process for the next few months and will return to future planning soon. The referendum on the April 4 ballot did not pass; the Library will not be expanding its building or services at this time. Please read the press release for more information. Click on the images below for a slideshow, larger images and captions. 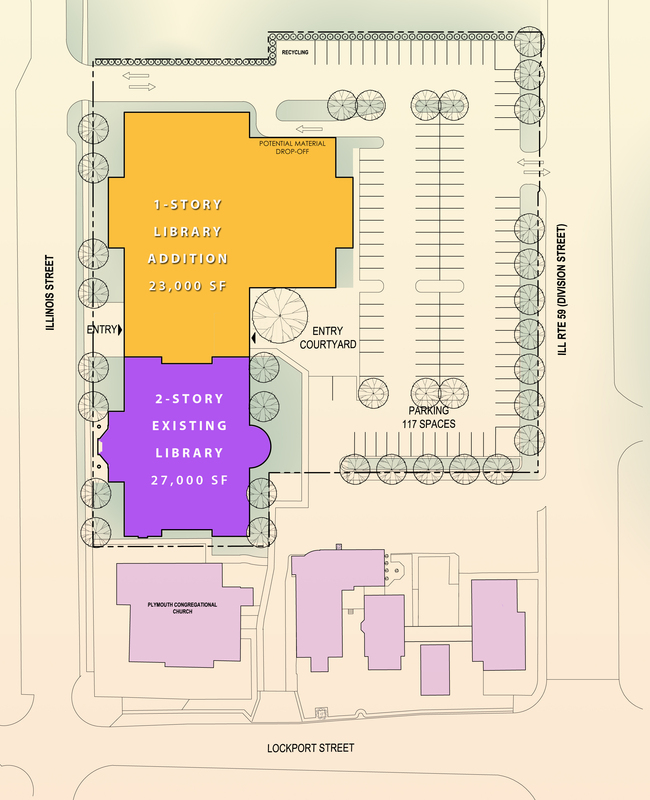 This site plan shows the current 27,000 square foot building and the 23,000 square foot one-story addition that would be added on the north end, into the parking lot. Additional parking will be added on the Route 59 side of the current parking lot. 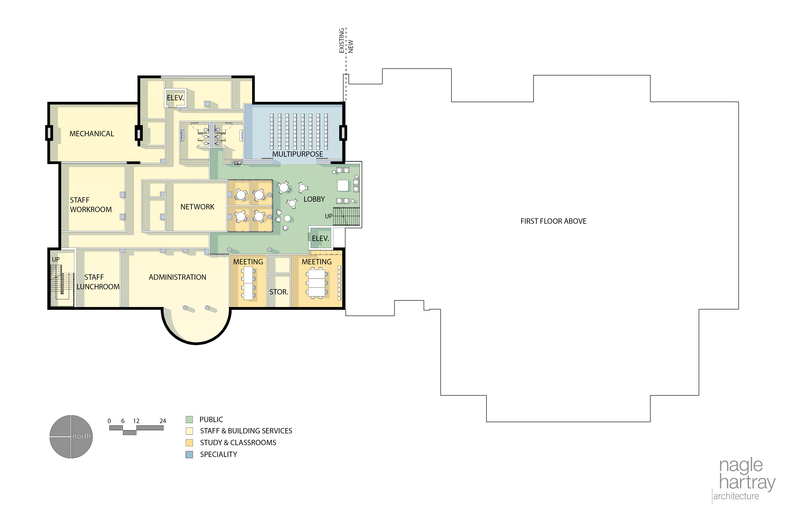 This conceptual floor plan rendering shows the one-story ground level addition, which encompasses all of Youth Services, popular materials such as the new Fiction/Non-Fiction, new DVDs, CDs and Large Print, as well as the lobby. 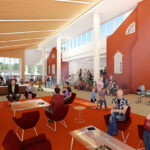 This image also shows the upper level, which will house the adult collections, a classroom/computer lab space, quiet study spaces and much more. 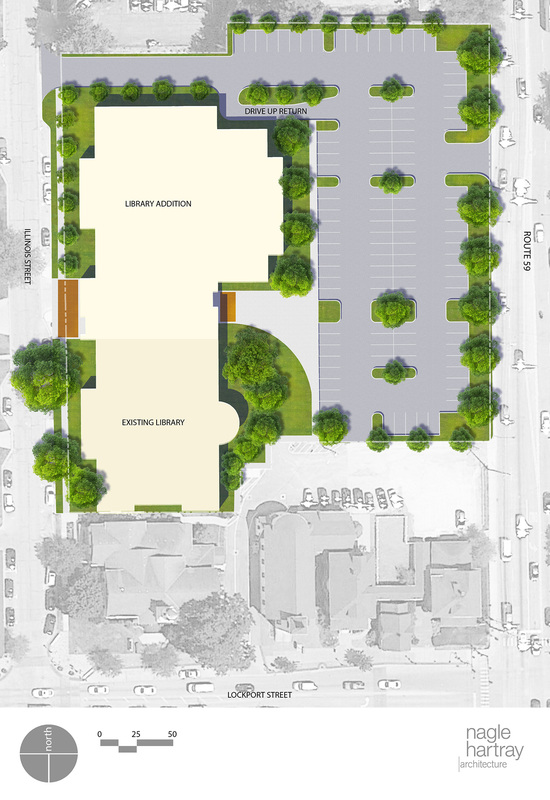 In this conceptual image, the lower level of the existing building would be used for meeting rooms of various sizes that would be used for Library events and could be used by community organizations as well. This space would also house staff areas such as administration, IT/servers, processing of new materials, staff lunch room, etc. 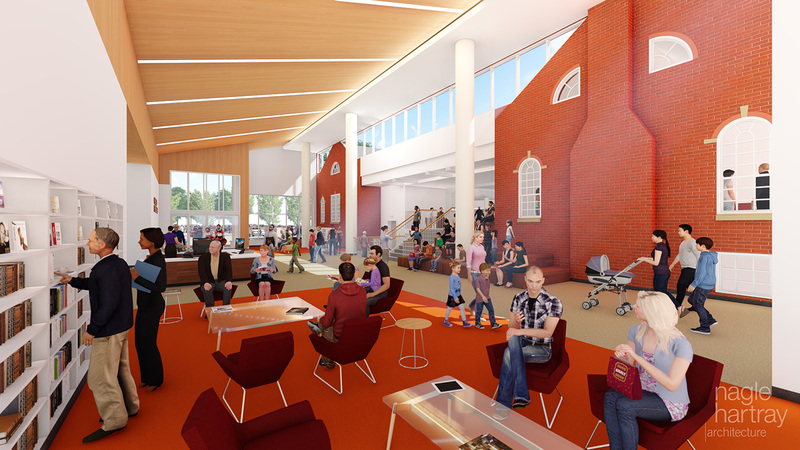 This is a conceptual image of what the expanded Library’s lobby might look as viewed from the Illinois Street entrance towards the main entrance, which will be from the Route 59 parking lot side. This lobby space ties together the original brick building to what will be the new popular items area and the Youth Services area. 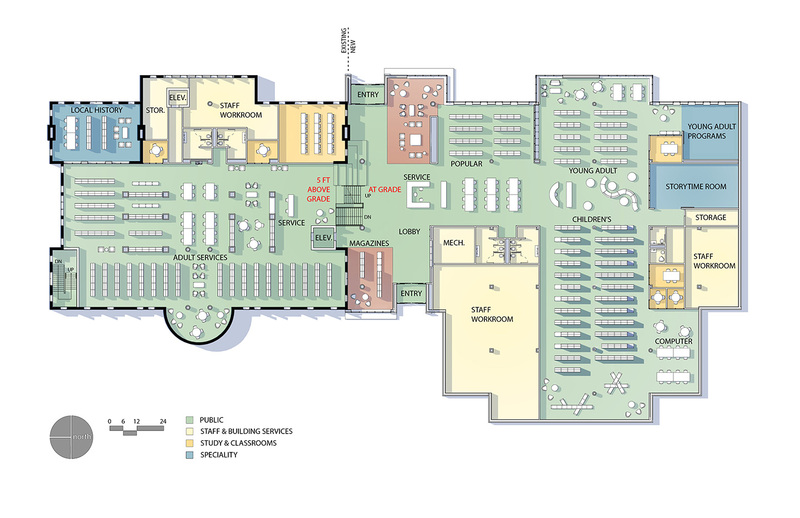 This image represents how the expanded Youth Services Department might look. 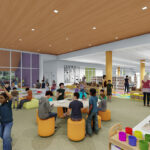 In this new design, Youth Services will be on the ground floor, making visiting the Library with strollers and young people easier to navigate. 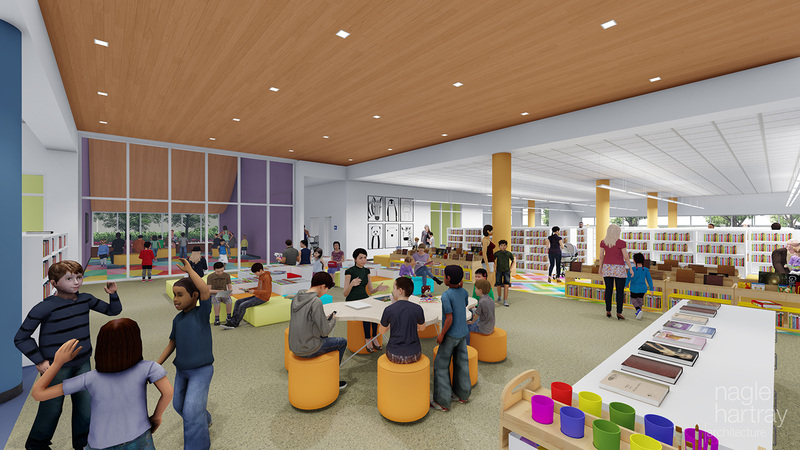 This space will include materials for babies through high school; it will have a programming room just for youth programs and a separate space for teen programs, quiet study rooms, an early literacy education space and much more. Exterior View: Main Entrance This conceptual rendering shows the Library’s Expanded Main Entrance, which would be on the Route 59 parking lot side of the building. The new entrance is on the ground floor and attaches to the current building, which is to the south/left of the entryway. 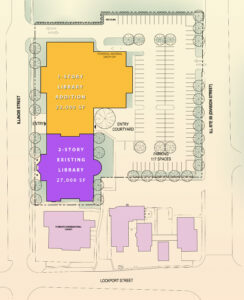 This image shows how there would still be an entrance from Illinois Street into the Library. This new entrance is part of the addition and is further north than the current front door. Trustees reviewed the final information campaign marketing pieces–an informational postcard that will be arriving in homes the week of March 20 and the Year in Review that covers statistics for 2016. Trustees voted to accept a proposal from Aero Building Solutions to do a full facility assessment. 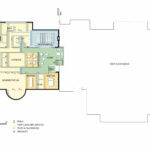 Architects from Nagle Hartray presented multiple renderings for the trustees to review. The Board revised some renderings and chose 5 views for NHA to finalize for early next week. 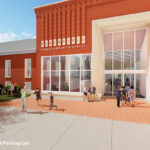 Those renderings, which are not finalized, will be available on the website by March 22. Exterior concepts for the entryway for the expansion were discussed and are being further refined. Nagle Hartray Architects also presented preliminary concepts for the addition. New designs will be shared at the end of this month or the beginning of March, which will include full building exterior designs as well as full interior designs. The Board of Trustees chose Concept 1 from the three design concepts that were presented by Nagle Hartray Architects. Architect Don McKay will further develop this concept for the February meeting. Trustees also discussed opportunities and events happening between now and April 4 at which the Interim Director, staff and trustees will be available to answer public questions. This information campaign calendar is continually developing and will be updated frequently. At this meeting, the Board of Trustees unanimously voted to adopt Ordinance 2017-1: An Ordinance providing for and requiring the submission of the proposition to increase the extension limitation for levy year 2017 to the District’s voters at the consolidated election to be held on April 4, 2017. A press release was released to the media on Wednesday, January 11. Also at this meeting, Ehlers Financial Advisors presented their final financial memorandum and report. At the December 14 Board Meeting, trustees chose from three options for the ballot wording. Legal counsel will be verifying the exact wording and Ehlers Financial Advisors will be putting together final numbers, so that if the Board of Trustees does vote at the January 10, 2017 special meeting to place a referendum on the ballot, they will be ready to meet the January 17, 2017 deadline. Architects from Nagle Hartray will be presenting the trustees with exterior design concepts ahead of the regularly scheduled January board meeting, allowing trustees to review and digest the concepts before providing NHA with their feedback at that January meeting. The trustees reviewed the results of the mailed and online survey, which you may review here. At the November 16 Board Meeting, the trustees received a final 10-year financial forecast from Ehlers Financials Advisors. The trustees considered three options for ballot wording for an April 2017 election. A date was set for a special meeting on Tuesday, January 10, 2017 to vote on putting a referendum question to voters. The next regular scheduled Board Meeting is Wednesday, December 14 at 6:30 pm. 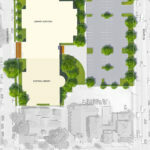 Architects Nagle Hartray presented updated renderings for a one-story 23,000 square foot addition. Steve Larson of Ehlers Financial Advisors presented a 10-year financial outlook for the Library based on no tax increase and another based on a tax rate increase of 15 cents. A mailer will go to all homes in the district at the end of November/early December with information regarding the proposed April 2017 plan. A short, 30-second poll will be included, with options to take the poll online or in the Library. Also discussed was the feedback received from the attendees of the Local Design Community meeting of October 6. Architect Don McKay of Nagle Hartray Architects presented the Board of Trustees with options for an addition to the current facility. Both options call for a 23,000 square foot addition, resulting in an approximately 50,000 square foot facility. The Board of Trustees has asked Nagle Hartray to continue to refine the one-story addition as it allows for a large, open floor plan that is more flexible and allows for adaptability as needs and technology changes. The Board of Trustees, based on feedback gathered after the failed March 2016 referendum, is focused on finding a way to keep the costs of a future referendum at around a $10/month increase for the average home valued at $300,000. 1990 was a memorable year in Plainfield. 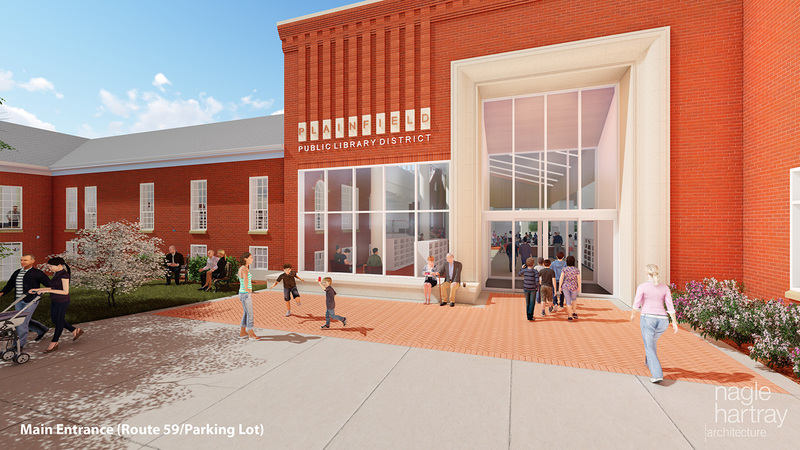 In the spring of that year, Plainfield voters passed the only tax increase in the history of the Library to expand the 1940 building from 2,700 to 27,000 square feet. 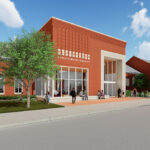 The Library building addition was the first construction to begin after the 1990 tornado and opened its doors in 1991. When construction on the Library began, the official Library district population was 14,123, with 5 schools in Plainfield School District 202. 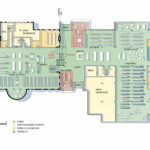 Today, the Library serves 75,337 with 30 schools in Plainfield School District 202. Over 60,000 more people are being served by the same 27,000 square foot Library. When the Library opened, it offered 2 word processing computers and typewriters for public use and collections included cassette tapes and VHS. Modern email did not exist. Today, more than 30 public computers are used for more than 35,000 hours of public computing sessions annually. Formats include DVD, BluRay, MP3, downloadable books and audiobooks, streaming music and video, ereaders, rokus, etc. The Library has over 230,000 items in its collection today, possible only due to virtual rather than physical items. “Why do we need libraries when we have the Internet?” The internet cannot provide the personalized help and hands-on instruction of the 21st century Library. In 1991, 2,236 reference questions were asked and answered at the Library. In 2014, it was over 54,000, nearly 25 times the number asked in 1990. Today’s questions are more complex because the easy answers are readily available. Complex questions, help with devices and teaching new technology skills comprise answers to today’s questions at the Library. Classes and programs are a huge part of 21st century public library service. 1993 was the first year the Library kept program attendance statistics – with 2,214 attending programs that were only for children. In 2014, nearly 65,000 attended a library program, spanning all ages. That’s 29 times more people attending programs in 2014. With 5 times more people in the Library district, doing 25 and 29 times the business in core services, the Library’s revenue has not increased that amount. In 1990, the Library district’s median home value of $99,000 paid $103 in property taxes to the Library, for $30.17 per capita. Today’s median home value of $295,300 paid $187.65 in property taxes, for $43.43 per capita. Adjusting for inflation, 1990 per capita revenue is $51.99 in today’s dollars. With more services and devices and formats in demand than ever before, per capita purchasing power has declined. In 2014, the average Plainfield Public Library resident checked out more than 8 items, attended a library program, used a public computer for an average session of 43 minutes and asked a question. That is $255.75 in value for materials and services received for the $43.43 per capita investment in the Library. Serving Our Public 3.0: Standards for Illinois Public Libraries sets 4 levels of standards: Minimum, Growing, Established and Advanced. Today, the Plainfield Public Library is below the Minimum standard for Staffing, Hours of Service and Facility Size. It is between Minimum and Growing for Collection Size.